Kanomax 3910 Airborne Particle Counter + $250 VISA Card! Order today and receive a $250 VISA GIFT CARD! Offer valid through 12/31/12. The new 3910 Kanomax particle counter is the smallest 6-channel particle counter on the market. And undoubtedly the easiest, most convenient to use given its large color touch screen, streamlined, user-friendly interface and pre-programmed standards mode that guides you through the measuring and certification process. The 3910 provides an impressive 50 LPM flow rate with a 0.3-micron sensitivity to speed your sampling process. The aerosol particle counter boasts an on-board thermal printer, compatible with dust-free paper and enough memory to record up to 10,000 measurements. Interface the 3910 with you computer by RS485 or Ethernet. Add on the optional differential pressure sensor and the ClimomasterTM environmental sensor to further extend your monitoring capability to include pressure, air velocity, temperature and relative humidity. We think you'll agree that the 3910 is the ultimate tool for cleanroom certification. 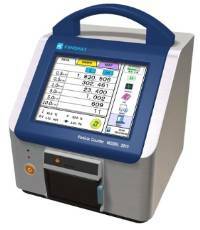 The 3910 Particle Counter comes complete with AC adapter, zero filter, Isokinetic probe, 79 inch (2 m) sampling tubing, inlet nozzle, memory card data processing software, 2 roles of clean printer paper, one Li-ion battery, and calibration certificate. 50 L/min (1.77 cfm) flow rate speeds the sampling process. Simultaneously measures and displays up to 6 particle sizes from 0.3 to 10 microns. Fully compliant with ISO 21501-4 calibration standard. Enables you to certify clean rooms up to ISO Class 2. Multi-standard mode simplifies clean room certifications based on ISO 14644, FS 209E, BS 5295 and EC GMP. Built-in printer and onboard datalogging (up to 10,000 records). Optional ClimomasterTM environmental probe adds the ability to measure airflow, temperature, and humidity. An optional 2nd Li-ion battery can be installed in the unit to extend the operating time. Extended 2-year warranty.